Early childhood education and school readiness are essential tools for setting your children up for success in this increasingly competitive economy. The US is lagging behind other countries in terms of enrollment, investment and the quality of foundation education. 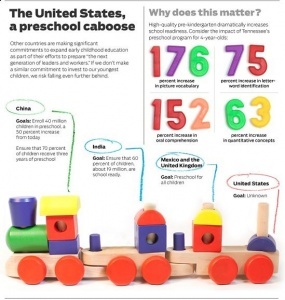 Given the importance of preschool education these numbers are very surprising. Only 69% of 4 year old children are in preschool in the US. 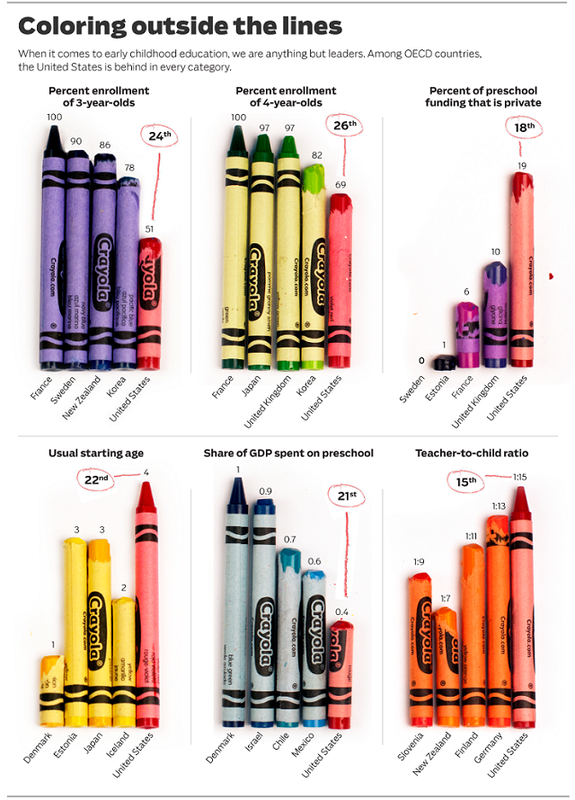 In contrast to Japan, a top performing country outpacing the united states, all children, 100%, aged 4 are in preschool. The UK has an average of 97%. Other countries also have higher preschool enrollment rates such as Mexico which is committed to enrolling all 4 year-olds to preschool, despite being significantly poorer than the US. France, Norway and Italy among others, ensures 90% of 3 year olds attend preschool while in the US, this number is barely 50%. Belgium enrolls children as young as 2 years old while Denmark typically enrolls kids as young as 1. In japan, Poland and Estonia, preschool begins at 3 years old. In the US, children are enrolled in preschool at the age of 4. Pre-math, pre-writing and pre-literacy skills are significantly improved when children attend preschool. Rising superpowers like China are increasingly making significant commitments to access to early childhood education. By 2018, India will raise the percentage of children who are ready for school from 26 to 60, for a total of about 19 million school ready children. The preschool system already reaches 38 million children under six. Commitments such as these are required if the US hopes to raise a globally competitive workforce. What do you think about preschool education? Is it necessary? What is the best age to enroll children?